It's great to see my friend Tim Getman getting better and better parts. He is firmly entrenched as a leading light in the formidable DC theater scene. The production of Cherry Smoke at Silver Spring's Roundhouse Theater, of which he both stars and co-produces with Jessica Burgess (who helped produce my own Wiener Sausage: The Musical! ), is a powerful exploration of the small-town psyche that accompanies extreme poverty and hopelessness. Getman plays Fish, a miscreant boxer who can't get anything right other than beating other people senseless. Tangled amidst the sparse setting of ropes hanging from the ceiling, he does a pretty good job of abusing the minds of those closest to him as well. 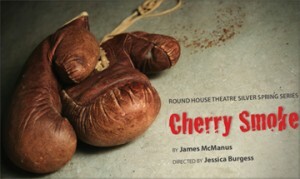 Cherry is played with Huck Finn-like goodness by Julia Procter. A country tomboy, she loves Fish with all her heart, waits for months at a time for him to return from his frequent stints in lockup, and seems to turn to smoke without the hot breath and embrace of her soulmate. Fish's little brother, Duffy (Cliff Williams III), and Duffy's wife Bug (Jjana Valentiner, a veteran of one staged reading of Wiener Sausage), help move Fish's story along. As Duffy narrates, he and his wife's ultimate normalness is an excellent contrast to Fish and Cherry's more passionate, but ultimately less sustainable, relationship. The performances are top-notch and Burgess has done a lot with a fairly minimalist script. The story is eventually tragic, and by the end, the audience cares greatly about and sympathizes with four characters whom urban theatergoers likely have little in the way of commonalities.